"Jets boats, helicopters and ziplines add excitement to any day out for couples." Looking for an exciting night? It is time to consider the Niagara area with a variety of options in and around Niagara-on-the-Lake, including the gorgeous town itself and Niagara Falls down the road, with helicopter tours, jet boats and a zipline over the Niagara River Gorge. Photo above from Whirlpool Jet Boats. 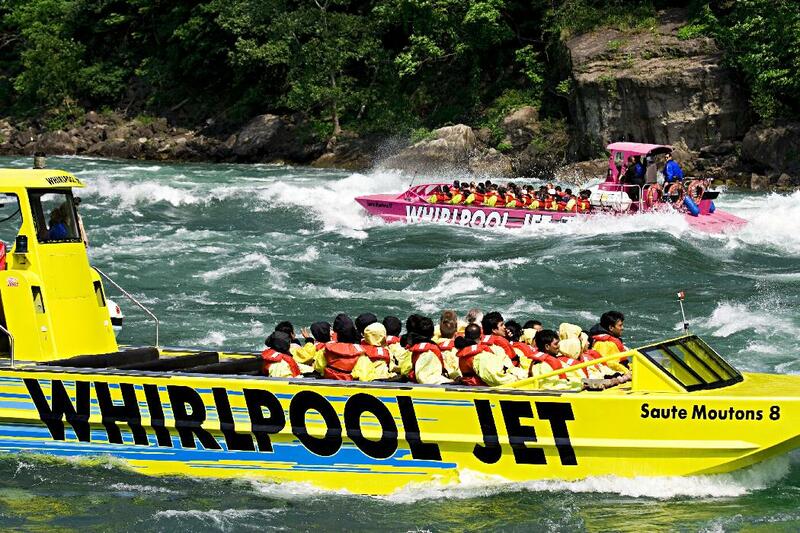 Whirlpool Jet Boat Tours celebrates its 25th anniversary in 2017 having been in business since 1992 and provides tours of the Niagara Gorge through Devil's Hole rapids and the Niagara Whirlpool. Here are some of the top date experiences couples can enjoy in Niagara-on-the-Lake courtesy as suggested by Whirlpool Jet Boat Tours. "Get a stunning bird’s-eye view of Niagara Falls and the gorge, courtesy of Niagara Helicopters. The helicopter flight follows the Niagara River, giving passengers an incredible view of the rapids, plus the Whirlpool and other sights along the river. Enjoy lunch or dinner aboard the Niagara Belle, a fully restored New Orleans-style paddle wheeler, as it cruises the Niagara River. Niagara Sunset Cruises operates a variety of tours aboard the Belle, taking passengers down the Lower Niagara River, through Queenston and Niagara-on-the-Lake, to the mouth of Lake Ontario. Tours depart from docks in Queenston. Whirlpool Jet Boat Tours takes adventure-seeking passengers on unforgettable jet boat rides from the mouth of the Niagara River through the Class 5 Devil’s Hole Rapids and to just below the incredibly powerful Niagara Whirlpool. The trip includes commentary from guides on historic locations along the route. Passengers can get onboard at three departure points: Niagara-on-the-Lake, Niagara Falls, Ont. (shuttle bus from Floral Clock on Niagara Parkway to Queenston dock) and Lewiston, N.Y.
Take your date for a jaw-dropping zipline ride to the base of Niagara Falls with Wildplay MistRider Zipline and then test your skills on a spectacular obstacle course suspended over the Niagara Gorge with Wildplay Whirlpool Adventure Course. After any of these adventures, you and your date will want to plant your feet on solid ground and relax. Drop by Niagara-on-the-Lake craft beer maker Silversmith Brewing Company to sample some award-winning brews and soak up the ambience in a renovated former church building."